When you listen to a lot of music, you sometimes make strange discoveries. Did you ever hear about yodel in La Réunion, one of the french overseas départements in the Indian Ocean ? Well here are two songs, in Creole, with orchestra. I found no information about the singers, Max Bertil in the first song and the Bertil brothers in the second one but here’s the story of Loulou (Elie) Pitou from the Orchestre Pitou. 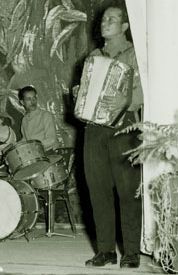 He was born in 1922 in northern Réunion and learned to play accordion at a young age. He soon leaded his own band and played at balls and marriages all over the island with a repertoire of dances like mazurkas, polkas, foxtrots… all of european origin but he absorbed also Indian and Malagasy traditions. He modernised the Creole repertoire and in the 50’s and 60’s, he recorded segas, a typical style of La Réunion with different singers. I don’t know why there are yodels in the songs, or even how the yodel came to La Réunion (I suppose it was the influence of french songs with yodel), but here are two songs. The first one, Viens ici, is a love story, the second one, Au revoir Doudou, is about emigration and the sadness of the loved one who is staying behind. You’ll find the songs on the cd of the Takamba label, Loulou Pitou et Benoîte Boulard, Du quadrille créole au séga.